To see a SOAR Ambassador please click on the "Book an appointment" button below. At the core of the service are our SOAR Ambassadors. These higher degree by research students offer one-to-one appointments and group workshops on a variety of topics to support you through your research journey. 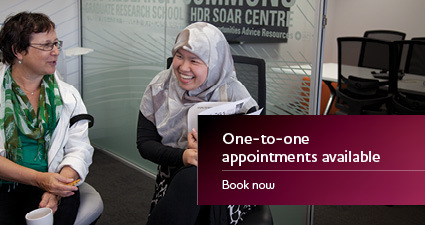 You can meet with Ambassadors in our SOAR Centre for one-to-one support, or in group workshops. Ambassadors are also available for a chat about anything to do with your research or student experience. Each semester the SOAR Centre employs up to 10 higher degree by research students as Ambassadors. Being an Ambassador allows you to get paid while you gain valuable personal and professional development alongside your research degree. SOAR sessions are group workshops on a variety of topics relating to your research journey. During these sessions Ambassadors share their own experiences and you are encouraged to join in by asking questions and sharing your own knowledge.